The jump rope is a cheap yet incredibly effective piece of exercise equipment that has widespread uses. Primarily, jump rope is a conditioning exercise that builds up stamina and endurance. 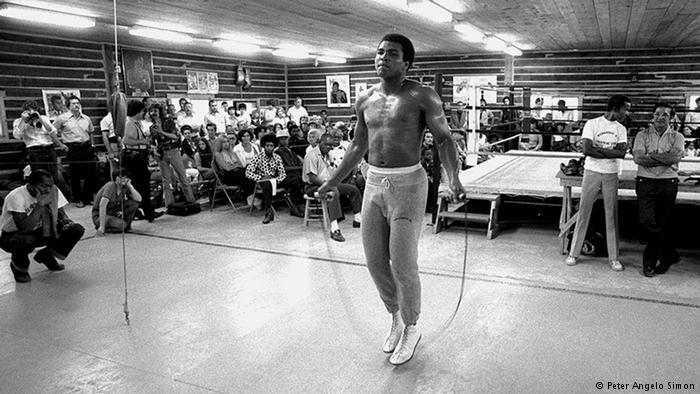 Jump Rope is especially popular among boxers and MMA fighters whose fights very often come down to who can stay on their two feet longest. Besides being a conditioning tool, the jump rope also comes with many secondary benefits. They build shoulder and leg strength and improve your balance and coordination. They also improve your agility and serve as a great way to boost your vertical jump providing the exercise is performed at high intensity. It’s no wonder they’re also a popular among basketball players who value both endurance and quick feet. While any old jump rope will get you started, investing in a nice jump rope is important if you’re trying to jump at higher speeds or attempting more advanced routines that incorporate things like crossing or crossfit double unders. 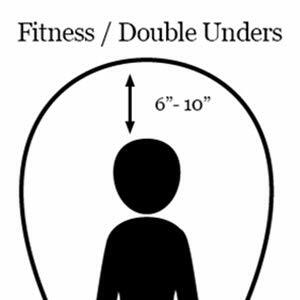 When it comes to picking a good jump rope, there are several factors that should be considered. The first consideration should be the rope’s spin properties. Competitive jumpers will typically go for ultra thin ‘speed’ cables that are lightweight and able to turn at high speeds. However, casual jumpers will find these perform poorly at slower RPMs and offer very little feedback (they feel too light). Casual jumpers therefore do better with slightly thicker PVC coated cables. The second consideration is handle weight. It’s common knowledge that it’s the shoulders and arms give out first – not the legs. Therefore, it’s important that the handles are light as possible to ensure you can jump for longer. The third consideration is rope length. 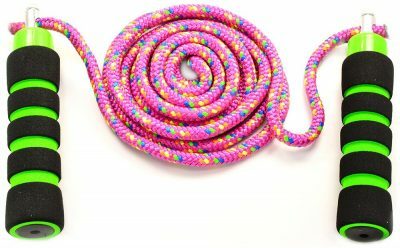 Unless you’re buying a cheap cloth jump rope from the bargain store, you’ll find the length of most jump ropes can be adjusted. The ability to adjust the rope length is an incredibly important aspect – a rope that’s even a little too short or long can be problematic. Other considerations are more ambiguous – for example the handle grip, the ‘feel’ of how the rope turns and whether or not the rope is suitable for rougher surfaces. There’s no right or wrong here, but keep them at the back of your mind. Besides the jump rope itself, there’s also the issue of cost. Don’t automatically assume more expensive = better rope, as the suitability of a jump rope is highly dependant on the individual’s skill level. Being aware of your own skill level is the first step to finding the right jump rope for you. With that in mind, we’ve created a list of our 7 favourite jump ropes for each kind of jumper. The Elite Surge 2.0 is the flagship jump rope from one of the biggest jump rope brands out there. It features lightweight aluminium handles with foam covers and a patented double ball bearing that makes for a very smooth spin. Durable: The cable is nylon-coated, meaning it is more durable than vinyl coated jump ropes. Thin handles may feel awkward for those used to using thicker handles. The Elite Surge 2.0 handles can take on many different weighted cables. Go from a 1/16” bare cable to a beginner-friendly 4mm PVC cord – and everything in between. The included standard 3/32” cable is great for most purposes. EliteSRS cables are USA-made and kink resistant. We truly believe you can’t go wrong with the Elite Surge 2.0. The handles are neither on the light or heavy side, the made in USA cables are top quality and the price point is just right. Furthermore, EliteSRS offer a variety of cables for every folk. It’s not hard to see why it’s the most widely-used competitive speed rope out there today. Although the jump rope can be used by jumpers of any level, the Elite Surge 2.0 might be overkill if you aren’t intending to perform any double unders (at some point in time). 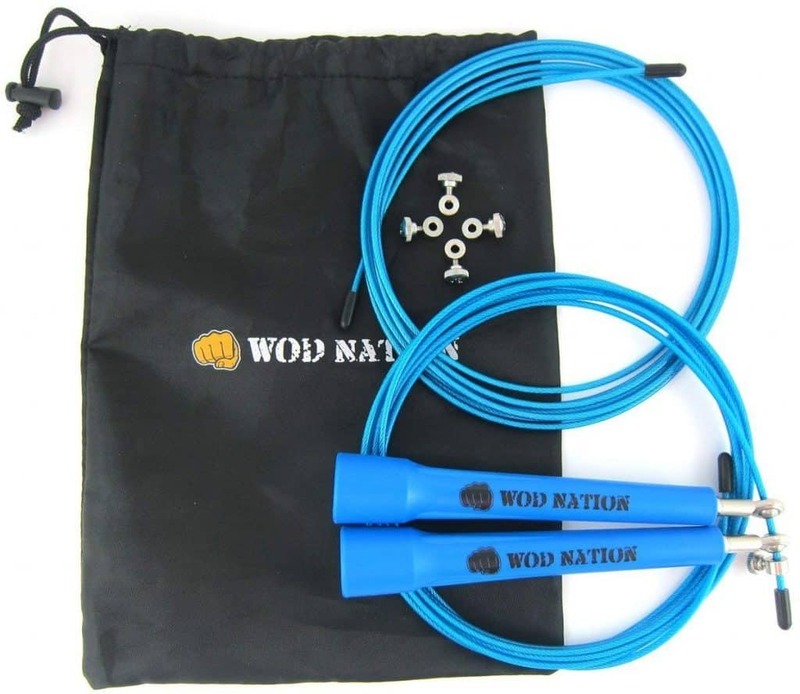 The WOD Nation Speed Jump Rope is a slightly cheaper speed rope that keeps up with the more expensive speed ropes on the market. A great budget-friendly choice. The 5.5″ long plastic polymer handles are incredibly lightweight (0.75oz), reducing shoulder and arm fatigue. Plastic handles lack grip. Grip tape recommended for those with sweaty hands. The WOD Nation is a solid pick for the budget conscious jumper that wants to be performing double unders at high speeds. WOD Nation also throw in a free second cable and carry bag, meaning it offers terrific value for money. If you’re looking for the smoothest spin out there, look no further than the Bullet Comp. There’s a good reason why it’s considered the world’s fastest jump rope. The double steel ball bearings and unique handle head design produce a lightning fast, almost frictionless spin. Self-adjusting head means cable resizing and replacing is ultra quick and doesn’t require the use of a screwdriver. The contoured 5.5″ aluminium handles produce a more ergonomic grip than typical flat grips. Weighing 1.6oz per handle, the handles are definitely on the heavier side, meaning arm and shoulder fatigue will kick in faster. 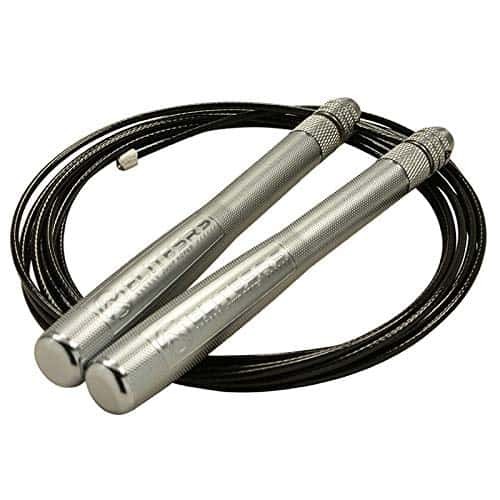 This is definitely a jump rope for the competitive jumper or jump rope enthusiast looking for something special. However, the majority of jumpers will probably do better with something else. Pure speed and double unders aren’t really your thing? Looking for a more gruelling muscle workout? Want to get the most out of single unders? A weighted rope like the Weighted Jump Rope By Pulse is probably your best bet. 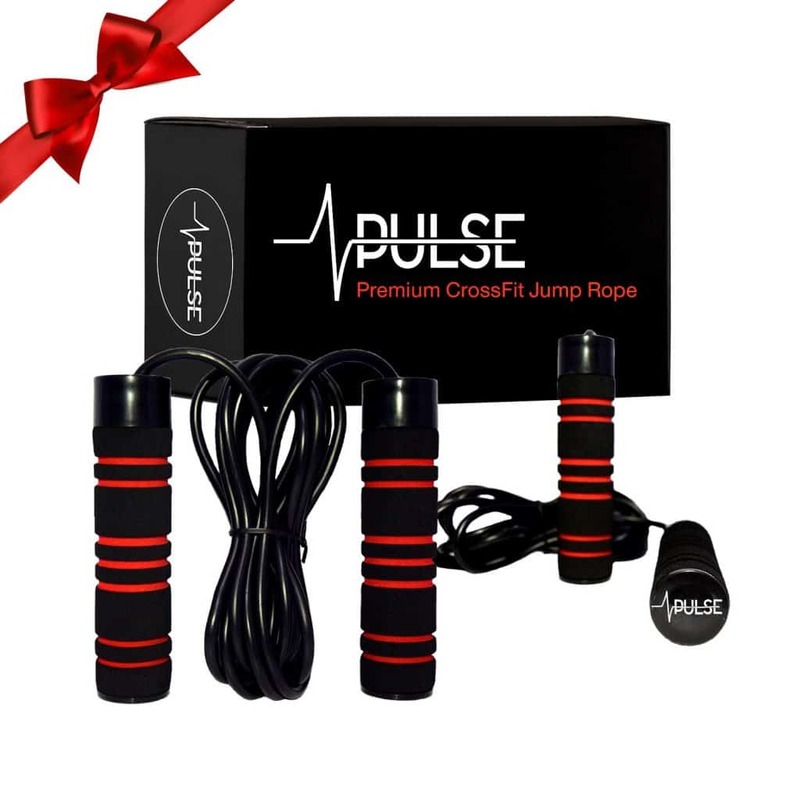 The Pulse jump rope features a much thicker 6mm cable and comes with 0.5lb weights in each handle. In total, the whole thing weights 1.2lb – much more than any speed rope. Weighted handles emphasise strength development. Overall, the Pulse jump rope is great for those looking for a slightly slower and less technical workout. The added weight means you’ll burn a lot of calories without having to spin as fast. Let’s face it, the thin stick handles we typically associate with speed ropes aren’t for everyone. 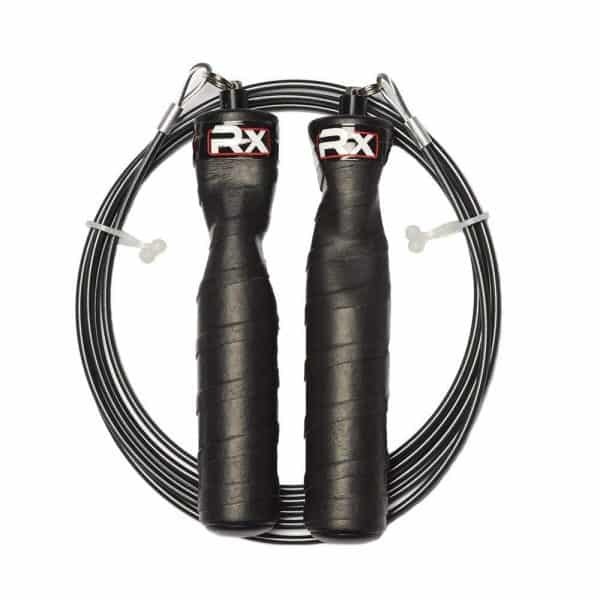 If you want thicker handles in your hands without sacrificing too much speed, the RX jump rope is a great choice. They are the jump ropes used by USA boxing who are responsible for Olympic-level amateur boxing. The biggest handles you’ll see in a speed rope. Very ergonomic. Multidirectional swivel axis bearing system produces a near frictionless rotation. Heavier 2.3oz handles mean arms fatigue quickly. Handle thickness not ideal for speed jumping movements. Not suitable for jump rope competitions. Vinyl coating that’s less hard-wearing than nylon wax coated cables. The RX Jump Rope won’t cut it for the competitive jumper, but most people don’t jump rope to participate in crossfit competitions. 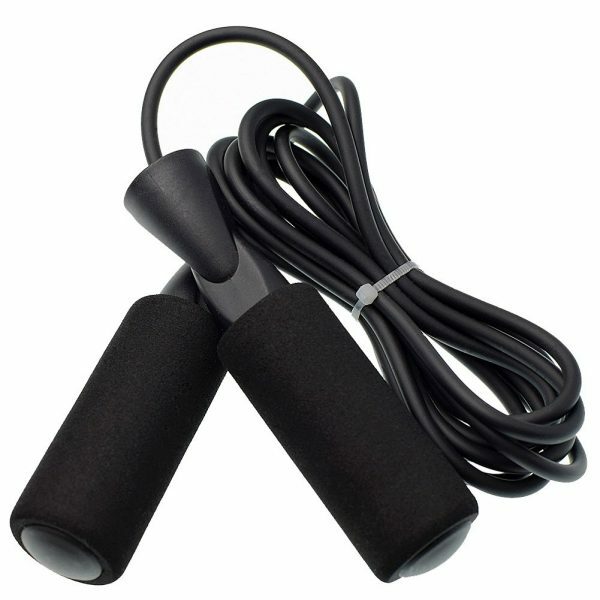 Many boxers, MMA fighters and other athletes favour the thicker RX Jump Rope handles. If it’s been a while since you last jumped rope, you probably don’t want anything too fancy. Something cheap and simple will suffice. 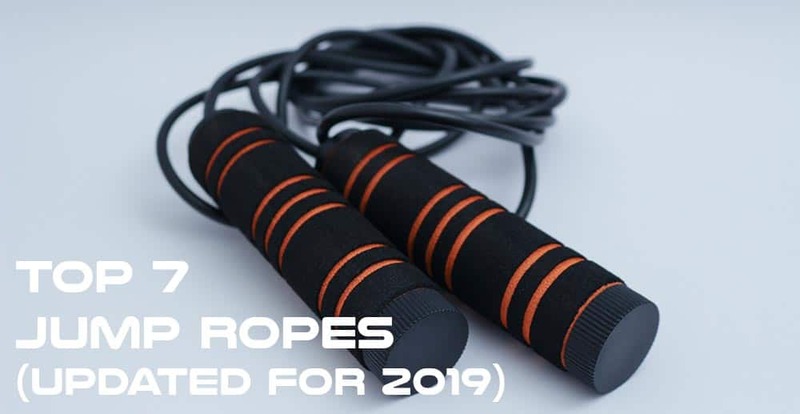 The XYLSports jump rope is incredibly cheap but still suitable for advanced jump rope workout routines that cloth or beaded jump ropes simply won’t cut. Non ball bearing handles mean the spin is nowhere near as smooth or fast as speed ropes. Leather jump ropes are becoming a thing of the past, but they have a uniqueness to them that you don’t get anywhere else. Everything from the smell to the weight and to the sound through the air and across the surface – one needs to try one to feel the difference. 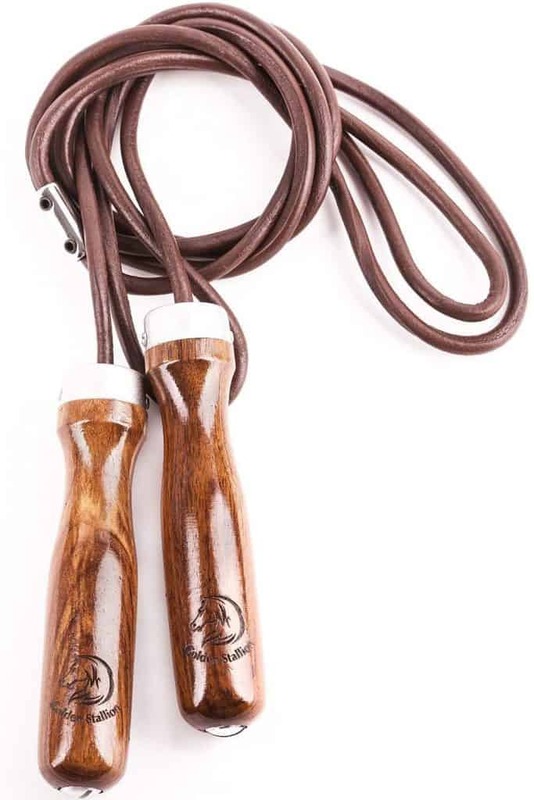 The Golden Stallion Leather Jump Rope features a high quality leather rope and old school wooden handles that can take removable weights to adjust the workout intensity. The Golden Stallion Leather Jump Rope isn’t for beginners or competitive jumpers, but as a piece of workout equipment it’s just as effective today as it was 60 years ago. If you want to change things up every now and then, it’s a great secondary jump rope to have around. Getting the right rope size is a bit of a challenge in itself. 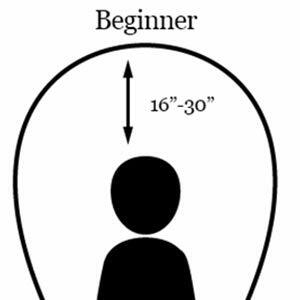 Besides your height, the ideal length of rope will also change depending on your skill level and jumping form. 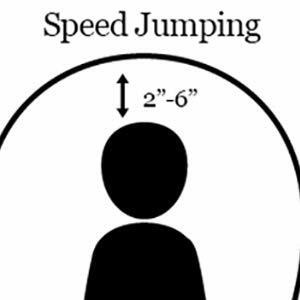 Finding Your Ideal Clearance: By clearance, we mean the distance between your head and the rope at it’s apex when jumping. Beginners want a larger clearance, while speed jumpers will benefit from a much smaller clearance. The outdoors might seem like the most logical place to jump rope. However, most jump ropes will not last long on concrete or other rough outdoor surfaces. A common solution is to roll out a yoga mat which doesn’t slide and jump on that. 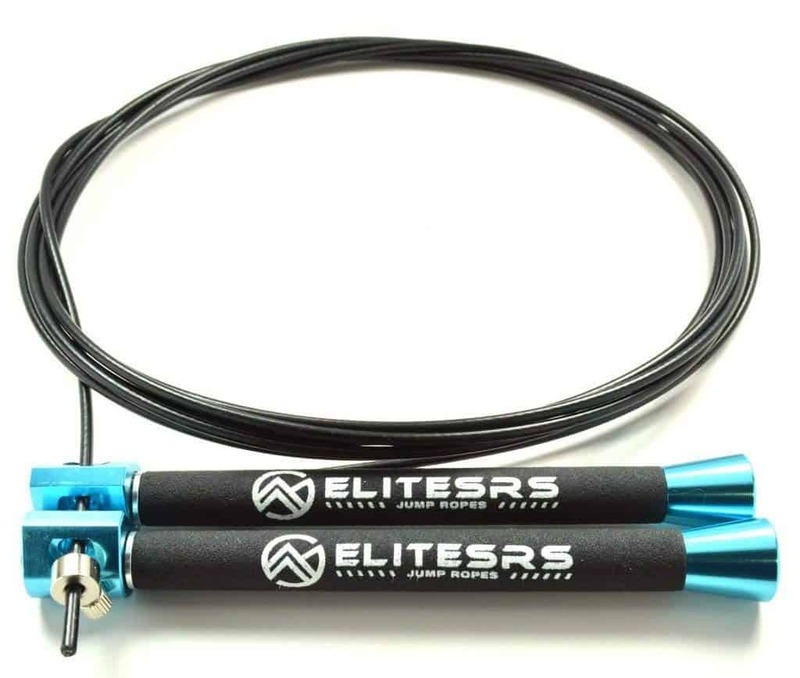 Another popular choice is to go for an outdoor rated cable, such as this one from EliteSRS (compatible with all EliteSRS ropes in our list and the WOD Nation Jump Rope). If you’re just getting started, the first goal should be to nail correct form and be able to jump consistently. Only after that is done should you look into more advanced jump rope methods.